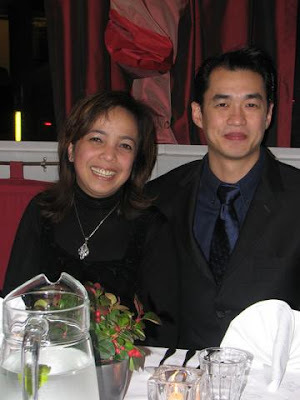 Syukur Alhamdullillah...today was the day when Mr Dear and I were joined in matrimony 9 years ago...Yup ! today is our 9th Wedding Anniversary. But, I was also crying partly because, today, on our special day, Mr Dear is not here with me. He is now miles away on a Business trip. Anyway, My Dear, if you're reading this, I wish "us" Happy 9th Anniversary, and may our anniversary reflect all the special moments we've shared and all the wonderful moments to come...I love you. These are some photos of Natasha and her friends during the Presentation on their Science Project recently. Parents were invited to examine the research and experiment done by each group based on the topic given to them. Group 1 (Materials) - Investigation : which are the stretchiest tights ? Even though I am far away from "home", I don't believe I missed eating most of our local food, coz here I am surrounded by friends who love cooking, good at it and always happy to share. On Monday, one of my best friend, who definitely falls in the above said category, Shereen, invited us over to her house in Zoetermeer to savor her famous Yong Tau Foo. Afraid that we might not get enough of her Yong Tau Foo, she also prepared Mee Kari to please our stomach as well. The food was yummylicious despite her "little error while preparing the food", which can happen to anyone (but seriously, I would not have notice if not for her disclosing it). Thanks Shereen for the invite and look forward to your next savouring meal. We have lived in Den Haag, to be specific, Mariahoeve for more than 6 years now. And every year we received a flyer inviting us to the International Foodfair ran by the Voluntarily Committee which is held every 3rd Saturday of November in a school building just at the end of our house's street. While close as it seems, we somehow never had the opportunity to go to this event, it was either we were buzy doing our routine groceries shopping or out sending our kids to a birthday parties. However, this year we've made it, but for a reason...both Natasha & Alyiah being part of the Brownies and Rainbows groups, were invited to perform some songs at the event. And we've been told that this is one of their yearly activities, so as long as both of them are in the groups, we will definitely have to mark our calendar for this date and event. After taking into consideration the preparation, the time needed and the popularity of our food, I decided to cook "Nasi Lemak" with "Sambal Sotong" and "Ayam Goreng Berempah". There were 7 ladies from 6 different countries i.e. Scotland, Sweden, Belgium, Canada, England & Australia. This was my first cooking demo but it wasn't as bad as I thought it would be and as planned, the food turned out good (to my own expectation, of course). In addition to that, I prepared some "Jemput-jemput Udang" for them which dissappeared in no time.